The location was really close to the airport, beach and local restaurants. Bike trip to Palma is taking 30+ minutes on a scenic route. 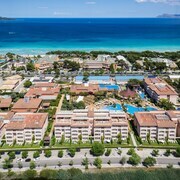 Nestled on the beach, this Muro aparthotel is within 3 mi (5 km) of Playa de Muro, Alcudia Beach and Hidropark. 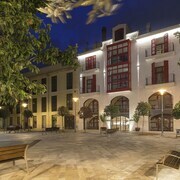 Alcudia Port is 2.6 mi (4.2 km) away. 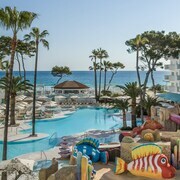 Cala Mesquida is located next to a wonderful beach. 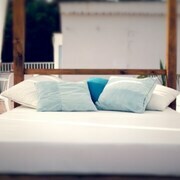 We relaxed on the comfortable sunbeds overlooking the ocean - marvelous. Tolle Anlage, tw. saniert, modernes Entrée, hell Das Hotel war für uns gut gelegen, da wir Freunde in unmittelbarer Nachbarschaft besuchten. Wir hatten nur ein 2-Mann-Studio für 3 Nächte gebucht, wurden aber upgegradet und bekamen ein Appartement. Nice place to stay for your holidays. 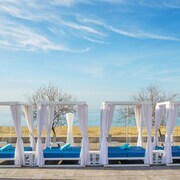 The hotel location is superb close to the beach, all amenities meet our expectations. The only issue we had with people smoking in the open areas for example close to "stage", while they were children around. Very good ! Jusy one problem not all room has air condition. Great staff, food ok but bit samey. Good sunbeds. Modern rooms. Drinks on all inclusive limited choice. Local brands. Would return. 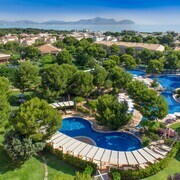 When it comes to going on a break to Majorca Island, you can go the traditional route with a hotel, or see things from a new, exciting perspective with your very own Majorca Island holiday rental. The price difference alone makes it a tantalising prospect, as you’ll enjoy huge savings on nightly rates when you go for your own apartment, villa or cottage rather than a hotel stay. But there are so many other perks, beyond simply getting more bang for your buck. There’s the sense of instantly becoming a “local” to the area, rather than just a box-ticking tourist. 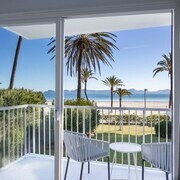 From the moment you set foot through the front door, a holiday rental in Majorca Island will become your home away from home, where you can relax in the living spaces and cook your own meals in the kitchen – perhaps with fresh, locally-sourced ingredients from a bustling food market close by. 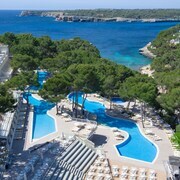 The feeling of real privacy is another major benefit that comes with Majorca Island holiday rentals. Whether you go for a sleek apartment, smart villa or cosy cottage, you won’t be in a busy tourist temple with hotel staff and other travellers around you all the time – you’ll have your own space where you can enjoy your holiday at your own pace. Have breakfast at your leisure at the kitchen table, chat over your list of must-dos in the living room, and then head out for hours of sightseeing before returning for your later afternoon siesta in a space which is truly your own. To make it easier to pinpoint the exact right Majorca Island holiday rental, you can use our map to find villas, cottages and apartments close to major landmarks and attractions, so you can choose to be in the thick of the action or in a more quiet and serene area. 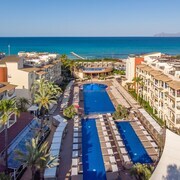 Just select your preferred travel dates and you’ll be able to find the best, most recently updated deals on Majorca Island holiday rentals in moments.